If you’re planning to attend the 34th annual Wichita Wagonmasters Downtown Chili Cookoff on Sept. 30, your plans should include getting there early. Not only will that strategy give you the opportunity to sample all of the chili and salsa varieties, but you’ll get a free airshow. Organizers are planning to kick off this year’s event with a low-altitude flyover down Douglas Avenue by a fleet of World War II airplanes. And because Wichita is the Air Capital of the World, organizers are also lining up several other aerial surprises throughout the day (hint: think military aircraft and vintage Stearman biplanes). To feed the expected spike in attendance this year, Adam Clements, a Wagonmaster who is serving as the event’s chairman for teams, is working to recruit as many as 100 teams for the 2017 cookoff. 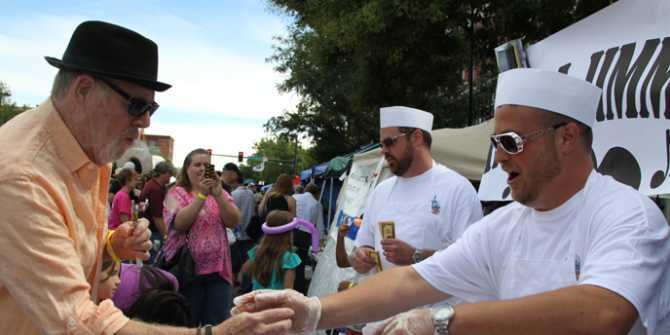 The competition typically attracts 60 to 70 teams, including cooks vying for a spot in the World Championship Chili Cookoff, groups of co-workers or friends cooking for fun, non-profits and local restaurants. “Wichita is the last sanctioned International Chili Society event in the region before the World Championship, so we have people who come from all surrounding states to compete for the opportunity to get entered into the biggest international chili cookoff competition,” Clements said. For attendees, that means a lot of excellent chili to sample. Tickets to the chili cookoff are not necessary, however you must purchase a $5 tasting kit at the event if you want to sample. The tasting kit also gives you a vote in the people’s choice contest and a full bowl of chili with fixings prepared by the Wichita Wagonmasters, a group of civic-minded business executives who help promote the good life in Wichita. Chili categories include no beans, green chili, red chili, anything goes and there’s also a salsa competition. Public tasting starts at noon but a line begins forming about 11 a.m. near the intersection of Douglas and St. Francis. The event regularly draws between 9,000-12,000 attendees. The teams are instructed to cook 8 to 12 gallons of chili and serve it up until they run out. In addition to the chili and salsa sampling and the flyovers, there are wacky contests including a pepper-eating challenge, live music, a beer garden and a kids zone within the festival perimeter. Kids can participate in games, activities and get an up-close look at a tank, concrete mixer and rescue vehicles. Plan on an afternoon of family-friendly fun at the Wichita Wagonmasters Downtown Chili Cookoff.